Destination Friday’s are the F’ing best, especially when new awesome peeps come and join us. The 5:30 and 6:00 AM groups seem to become just as popular as the 6:25 group. The new faces that joined us today were Kristin and “Jersey” Chris. Both starting strong with the 5:30 group knocking out some miles and joining in with the early morning chatter and banter. If you didn’t get a chance to come out and meet these two awesome folks make sure to check them out at another workout coming up. 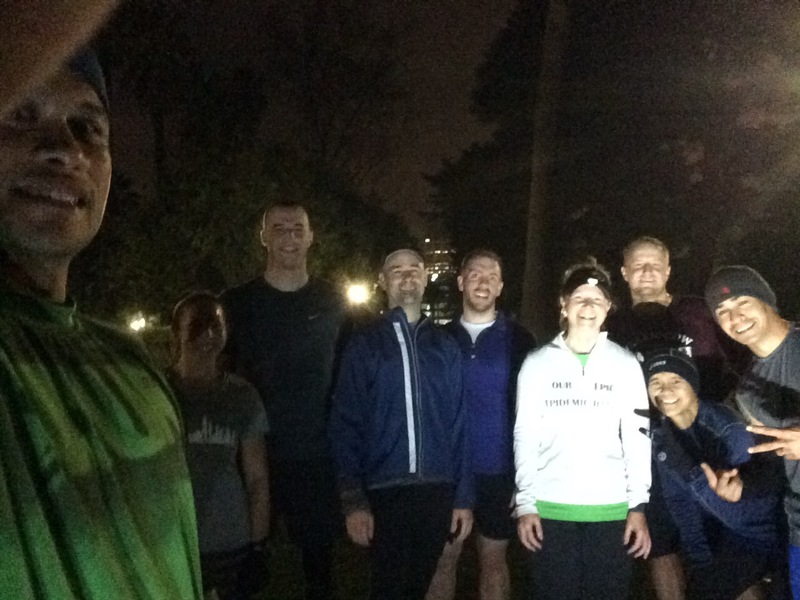 When 6:25AM rolled around we had completed about 5 miles with the two run meet up groups. We tacked on a bit more by making our way down to the IMAX on K Street. The deck of cards workout for today was pretty standard with 10 rounds of pulling cards and doing some work. Faces and Aces were 11, the joker doubled the work of the next card pulled, and each number card was just straight up. After ten rounds completed, it was time to call it a day … one question WTF is it always windy when we go to the IMAX?!?! Nonetheless, still an awesome morning to get the workout completed and get the day started. Also we love it when people end workouts with a commitment! Today at the end of the workout I asked “Jersey” Chris, “See you next Wednesday?” … he responded with “Yes” … as many of you know if he doesn’t show up … he gets a shout out! This is “Jersey” Chris … we hope for his better judgement he shows up on Wednesday. Previous Article We don’t even have a name for it. Next Article This is Courtney.